When I became of legal age to buy wine in my home state, much of Western AND Eastern Europe had long since been making wine; almost since dirt had been invented. California was mostly agricultural, growing prunes, almonds, apricots and other products. Prohibition had its negative consequence on many of the early Italy-to-California wine pioneers who abandoned their craft and turned to dairy farming and cheese making. That changed with the judgment of Paris in 1976, but even so, distribution of fine California wine was limited to the point of being scarce in many areas of the U.S. Drinking fine wine then meant French. Italy, Spain and so many other countries were producing excellent table wine, but it was generally not being sent to the U.S. instead being consumed locally. But France? Yes, French wines were to be had and they were commonly available at even small neighborhood liquor stores. French wine, blended so expertly and made in an “old world” style was both unique and a hallmark of fine wine. And so it was “the best of times. It was the worst of times.” Best in that wondrous Premier Crus Bordeauxs of complexity and depth; stellar wines like Lafite-Rothschild and Mouton-Rothschild could be had for $20 and less. One could vicariously explore the bounty of the Medoc, Graves, Pomerol, Saint-Emilion and Sauternes Barsac with just a budget conscious pocketbook and learn the differences terroir made before the word itself became jargon. It was the worst of times because we all know what happened since. Once accustomed to what many consider still the best of wine, prices rose so dramatically that the price of a Premiere Cru exceeded that of middle-income mortgage payments. Devoted and now accustomed to the art of French blending, the average consumer – scared away by prices announced in the media – now did without. There were some vintages so outstanding that excellent wine could still be had inexpensively. And wine from Chateaus producing delicious Bordeaux Superieur in those years could still be enjoyed inexpensively, but these things took some knowledge beyond casual interest. Once tasted, being denied can be cruel indeed. And waiting five years for the next great vintage morphed into simply not waiting and, for many, going elsewhere. It became the worst of times because that reference point, the knowledge base of what is left bank, what is right bank began to erode from the group consciousness. in Bordeaux for five generations. 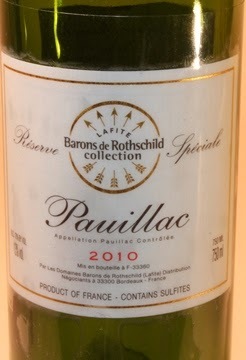 In addition to the wines issued from their world renowned vineyards, Les Domaines Barons de Rothschild (Lafite) has been elaborating a range of wines which are easy and pleasant to drink and are called “Reserves.” I had the opportunity to taste this wine recently and found it not just enjoyable but capable of inducing hints of wines enjoyed from those days past. While made for more immediate drinking, the “Reserves” are made in a style similar to the Chateau wine and hint toward classic elegance and a respect for tradition. Lafite Reserve Speciale is a blend of Cabernet Sauvignon (60%) and Merlot (40%) from properties in the Pauillac appellation. And the 2010 vintage for this area was rated a 90/100 by Wine Spectator. In the glass, the wine presents medium garnet and a nose of classic Bordeaux in a balancing act so appreciable in French wine: hints of earth and dark fruit, faint scents of dried flowers. The wine is medium bodied. Oak is present but not intrusive. Its fruit carries to the finish, but is well balanced so that the whole is better than its individual components (cinnamon, vanilla. mocha, blackberry, cedar, leather, forest). Its tannins are smooth but build slightly in the back taste which made for an excellent and clean finish. While not the prestigious and famed wine of the Chateau, Lafite Reserve Speciale Pauillac 2010 benefits from the knowledge of the Domaines Baron de Rothschild (Lafite) teams who take their skills to the task of making affordable wine with a respect for tradition. Rothschild Reserves offer this more casual drinking wine style also as “Reserve Medoc,” “Bordeaux Rouge,” and “Bordeaux Blanc.” Each label offers the opportunity to appreciate the uniqueness of its area (terroir) and an opportunity to get some practical experience with the term “old world” style wine and, in that process, to learn why so many people who love wine love Bordeaux wine so much. My price search revealed wildly different prices, so much than even a realistic ARP was difficult to establish. Ranging from less than $25 to a high of $55, I found it commonly available at $42. Shop carefully and enjoy two bottles. After de-stemming and crushing, the plots are vinified separately with fermentation and maceration between 3 to 4 weeks. The wine is aged (40% barrel) for 12 months and fined with egg whites. * 2010 sample provided by publicist for review.